Every once in a while, I'm struck with a bout of insomnia. I find refuge in TV, seeming to always catch a showing of the execrable Denzel Washington vehicle “Ricochet”, or one of the “Ginger Snaps” trilogy of films. I couldn't sleep about a week ago, and found myself flipping around, and landed on HBO, at about 2 a.m., and watched the documentary “Alive Day Memories”, produced by “The Sopranos” James Gandolfini. Getting to sleep afterward, was the least of my problems...that wasn't going to happen. It was where it took my mind for days afterward. If you have issues with seeing the human body in states of post-trauma disrepair, this program is probably not for you. We walk around all day long, and take for granted what out healthy, intact limbs and appendages enable us to do. When you see these soldiers...and their war-broken bodies—sometimes with a momentary flash to a photo of their moments in triage after being injured in Iraq...it will touch something deep inside you. You may have to look away for a moment. You will grind your teeth. You will thank God that you are relatively healthy, and then your mind will wander to thoughts about these soldiers families and loved ones, and you will start to ask how in the hell these people are coping with the events that have so changed their loved one. So altered them visually, tangibly...and worse than that...intangibly, and within. The term “Alive Day” refers to the day each of these soldiers was injured/damaged in a war event—be it an IED, a sniper's bullet, a vehicle rollover, or witnessing a person you have come to call friend during the hell of war, have their life snuffed out—“whiff!—while mere inches away from you. The truncated, gnarled and pockmarked bodies will visually arrest you. But what hit me doubly hard was the damage to the psyche of some of the people Gandolfini interviews on the stark set. Prosthetics you see. Sleeves and pant legs tucked and pinned to neatly cover where missing limbs once were, are on display. But it's the haunting words of these for the most part, young soldiers that will stay with you and echo coldly in your quiet moments. A couple of those interviewed will at first scan as “the lucky ones” , as their physical damage is somewhat less than that of the more egregiously wounded ones on camera. But you need to hear their words. And look into their eyes. Do that—and you will understand the complexity of the damage a war—particularly this criminally unnecessarily war has wrought. You will worry for these young people, and worry even more about the ones yet to come home. You will see the shattering effects of this war on their bodies, and on their minds in terms of what Post-Traumatic Stress Disorder looks like when it's playing out in front of you. Gandolfini does a great job, just letting the soldiers speak, and following them around for a bit as we see them live their lives. And he lets you see it there in the raw. The anguish...the trepidation...the “this is what I will have to live with from here on out” fear is so thick you can palm it. And whether our so-called “candidates” for the presidency get these soldiers out of there quickly or not (last night's “debate” has tempered any optimism I may have had on that hope in a BIG way), these troops will be coming home someday. All 170,000 of them. And after watching “Alive Day Memories”, your concern will go from “Oh, thank God you're back!”, to “How do we fix the damage that has been done to them, and lessen that damage's effect on us as a whole. There will be tales that lift your spirit...and tales that will make you cry because you just KNOW that for some of these troops...it is going to get a much, much worse. It isn't family viewing. It's tough. And unflinching. If you have sensitivity issues, again, take a pass. 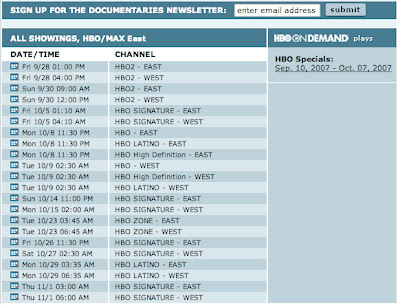 If you can deal and want to see this eye, and psyche-opening piece of television, here's the upcoming schedule for it. Mrs. Clinton, Mr. Obama, Mr, Edwards? You can do something should you be elected, to lessen the number of people who will end up like the soldiers shown in this film. Bodies torn, brains skewed, thanks to one man and his handlers' hubris. Watch this, and don't tell me—tell them—some more of your “I just don't know when we'll getcha home” platitudes, as they suffer in the sand, on your watch, for nothing.